You can have the best kitchen in the entire neighborhood and have one item missing making all of it a waste of time. Everyone who knows décor knows that a spectacular backsplash and a great countertop is the one thing that makes a kitchen stand out. A good countertop is what your guests will remember the most when they leave. This is the spot they will watch you cook on and get the feel of your home. This is also where you will create and perhaps eat breakfast with your family every morning so you want to at least have the best for them. Kitchen countertops in Fairfax are not easy to find but you can bet USA marble and granite has your back. The company supplies different types of kitchen countertops to the area. There are several options to choose from and you do not have to be stuck with the same old countertop that you installed when you moved into your home. The one you have may be outdated or you just want a change in your home. Either way this company is the way to go. Numerous options are available when it comes to styles and colors. The company has several color options which may make it easier to match the décor in your home. From the classic white marble with different wave colors to the moon black granite. Marble and granite come in different styles. You can have the granite plain as it is or with an extra glossy shine. Marble countertops are just exquisite! This is the one natural stone whose beauty has tried to be mimicked by so many companies and not only those in the countertop business. The stone is perfect for those who cook often since it is heat resistant. That is right you can take a pan right off the stove and place it on the counter and it would not make a difference. This is possible because the marble is formed natural by heat compressing the stone hence the pressure lines on it. When we talk about kitchen countertops in Fairfax then granite is definitely one of the popular options. This particular stone gives you so many options when it comes to color options and design. The granite countertop can transform any dull to kitchen to look fabulous. The stone is also very durable. You will enjoy every penny spent on the purchase and installation for days to come. 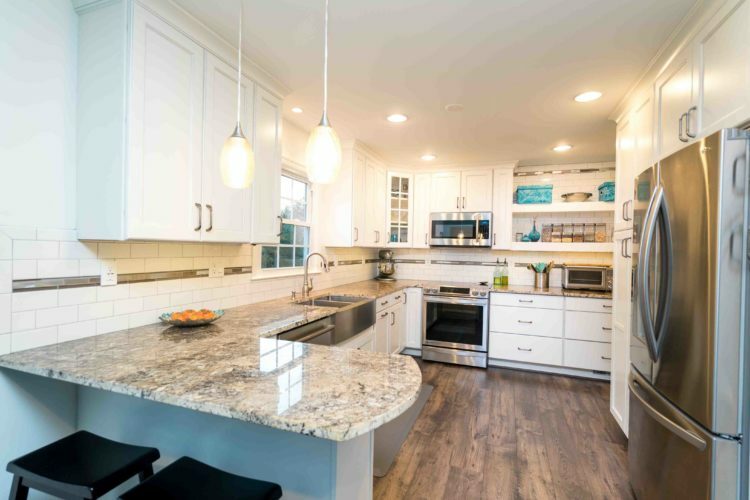 Another popular kitchen countertop in Fairfax is Quartz. Yes, we know quartz is a man-made stone but that just gives it so many more possibilities compared to natural stones. The quartz countertop for example can be colored in many more options than the previous two stones because of the small percentage of polymer that is used to make it. Quartz is also a lot easier to care for than the natural stones.